If you fly even a few times a year, chances are at some point you'll have your flight delayed or canceled. About one in five flights by the major U.S. airlines have been canceled or delayed this year, according to the Department of Transportation. Worried about getting to your destination on time? Consider these strategies. If you book the last flight of the night and it's canceled, you can guess what will happen. You and every one of your fellow passengers will try their hardest to get on the next flight out the following morning. And yes, an overnight stay is imminent. If you fly morning flights, on the other hand, you'll have a good chance of squeezing onto another flight later in the day. This is especially true with popular routes that feature several flights departing from your home airport on a daily basis. According to a recent study from CheapAir.com, the cheapest days to fly this summer are Tuesdays and Wednesdays. You'll save $62 per person on average if you avoid Sundays (the most expensive day to fly). You can also save if you avoid the month of July altogether and travel instead during late summer or fall, when airports are less crowded. This is the simple result of supply and demand. Since weekends and certain months are busier times to travel, airfare costs more. But there's another reason to avoid those busy times. The more flights that are scheduled and in the air, the more chances of something going wrong. If you want to reduce your chances of having a flight canceled or delayed and perhaps save some money in the process, avoid flying on busy weekends and choose off-peak days instead. Another way to reduce the chance of delays or cancellations is to avoid congested airports. The more flights coming in and out, the more schedule changes may take place. By choosing an airport with fewer flights, you may reduce your chances of having your travel plans spoiled by a cancellation or delay. If you live in an area with more than one airport, consider flights from the smaller of the two. Some airports are more prone to cancellations and delays than others, for various reasons. MileCards recently profiled the best and worst airports in the country in terms of on-time departures during the summer. According to its study, Newark has the worst 10-year record for summer travel, with only a 66.5 percent on-time rate. New York's LaGuardia and Kennedy airports, San Francisco, Boston, Chicago O'Hare, Philadelphia, Miami, Washington Reagan, and Columbus round out the top 10 worst airports. If it's feasible to avoid these airports, you can add this strategy to your delay-avoiding arsenal. On the other hand, Kahului, Honolulu, Salt Lake City, Orange County, Phoenix, Seattle, San Jose, Minneapolis, and Las Vegas are the best for on-time summer travel, according to the report. This tip goes without saying. Whenever you travel over a holiday or peak travel time, there's more chance of something — anything — going wrong. Peak travel times can include entire seasons like "summer," but they can also include peak travel weeks like spring break and winter break. It also depends where you're traveling. While "peak" travel time to Europe is summer, winter is the most popular time to travel to the Caribbean. You can't always avoid traveling during peak times, but it helps to keep the fact that delays and cancellations are more likely during these times in mind. 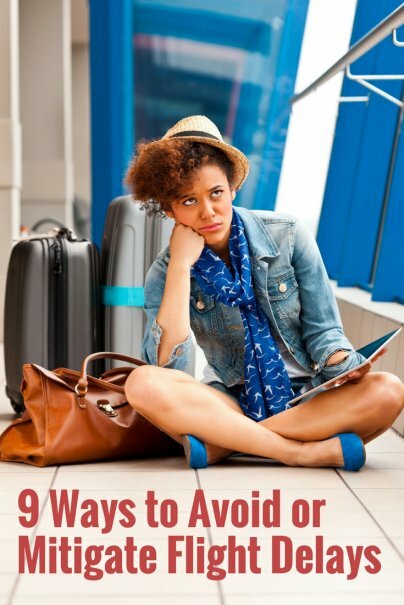 If you're going to travel during peak travel season, using some of the other strategies on this list could lessen the impact of a delay or help you avoid one. Here's another smart tip: If you are paranoid about cancellations, try choosing your alternative flights and having the information about them written down and easily accessible. That way, if your flight is indeed canceled, you'll be ready to let the airline know a solution to your issue. By having flights picked out, you can beat the masses who aren't prepared and have no idea what to do next. The agents at the gate not being helpful? Does your credit card have a concierge service you can call? Does it give you access to an airport lounge (where you cannot only sit out the delay in quiet and comfort, but where there are available agents that are not as harried as the ones at the gate facing a long line of angry and irritable customers)? Can you book a new flight with your points so you don't feel the sting of the extra charges as much? Some may even provide a refund for your delayed or canceled flight, as well as for charges incurred because of it, if it includes the right travel insurance. This tip may sound crazy, but if you're worried about flight delays and cancellations, never check a bag. Once your bag is on a flight, you could experience severe hardship tracking it down if you wind up on another flight leaving later that day or the next day. By sticking to carry-on only, on the other hand, you can ensure your bag is always nearby — and never in luggage purgatory.